Dig that clam! And enter our new contest. The winner of the latest At Large photo contest is Todd LaJeunesse, an associate professor of biology at Penn State. 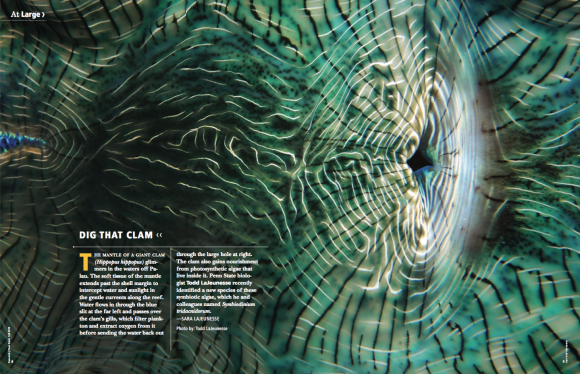 His image is a stunning abstract of the mantle of a giant clam in the waters off Palau. The photo (above) is prominently featured in the October 2015 issue of Research|Penn State. In addition to publication of his photo, Todd will receive a high-quality print of the At Large spread, suitable for framing. As Principal Investigator of the Symbiosis Ecology and Evolution Laboratory, Todd studies the diversity and health of corals and the symbiotic algae that live inside their tissues. He also identified and helped name a symbiotic alga in the giant clam. Thank you to all who sent images for our consideration. It’s always enjoyable to see so many fine photos from our faculty, staff, and students. Image must be a strong horizontal that completely fills a two-page spread. Image must be available at high resolution, at least 300 dpi (this is not the same as ppi). Keep this in mind as you shoot. We have had to eliminate beautiful images from consideration because they were not shot at a high enough resolution to be enlarged to publication size. Images must relate to research being conducted by someone at Penn State. Images can be scenics, close-ups, or micrographs. They can be realistic or abstract (such as a patterned structure); color, black & white, or colorized. Archival shots will also be considered. We will write the short description of how the image relates to Penn State research, based on information you provide. Please send your photos to me, Cherie Winner, at clw43@psu.edu. Lo-res versions are fine at this stage. If we select your image, we’ll ask for the hi-res version. Deadline for submission is Friday, December 18, 2015. For more information, drop me a line via email or the comment form below, or call me at 3-4750. Previous PostA Tale of Two Cities—and Countless Scoops of Ice Cream!Next PostFast & curious: what drives fast-growing firms?